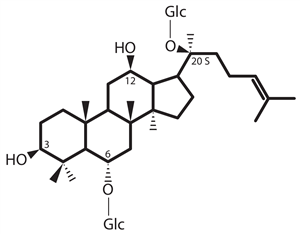 It is a damaran, protopanaxatriol panaxoside (6-Glc, 20 (S) -Glc PPT). It supports the production of IL-4 and the maturation of T H 2 lymphocytes ( Lee2004gre ). Gssd. Rg 1 tended to increase the aggression of mouse mice ( Yoshimura1988ace ). In contrast, gssd. Rb 1 , as well as total ginseng extract, suppressed aggression.